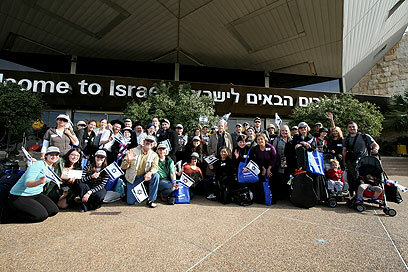 Fifty-two North American olim arrived in Israel on Thursday on a Nefesh B’Nefesh Group Aliyah Flight. Among them was 23-year-old Genna Brand, who is the newest addition to Israel’s National Women’s Soccer Champions, ASA Tel Aviv. Also on board the flight was Geoffrey Rogg, 70, who met David Ben-Gurion while working on an Israel fundraiser in 1969. While updating the former prime minister of his progress, Ben-Gurion’s first response to Geoffrey was, “Young man, all I want to know is when are you coming to live in Eretz Yisrael?" Founded in 2002, Nefesh B’Nefesh in cooperation with the Israeli government and the Jewish Agency for Israel, is dedicated to revitalizing aliyah from North America and the UK by removing or minimizing the financial, professional, logistical and social obstacles of aliyah. The support and comprehensive social services provided by Nefesh B'Nefesh to its 29,000 newcomers, has ensured that 97% of its Olim have remained in Israel. See all talkbacks "52 new olim arrive from North America"